Pump Station Design Service offered Free with AutoCAD based on CFD / Model Tested – HI Approved Pump Station | JCI Industries Inc. In designing a pump station many times you need to balance efficiency and performance. An ultra conservative approach often leads to large pump stations that may an opposite affect on performance where larger volumes result in lower sump velocities, settling of solids, and stagnant conditions that can lead to damaging surface vortices and odors. Poorly designed stations can also lead to high operation and maintenance costs, clogging of impellers and damage to pumps. Flygt’s experience and research helps customers design pump stations that minimize costs related to investment, footprint, and energy consumption and maximize the station and pumps performance. One of the things that Flygt’s research has shown, for example, is that smaller pump stations can improve hydraulic performance and help avoid problems with stagnant areas. 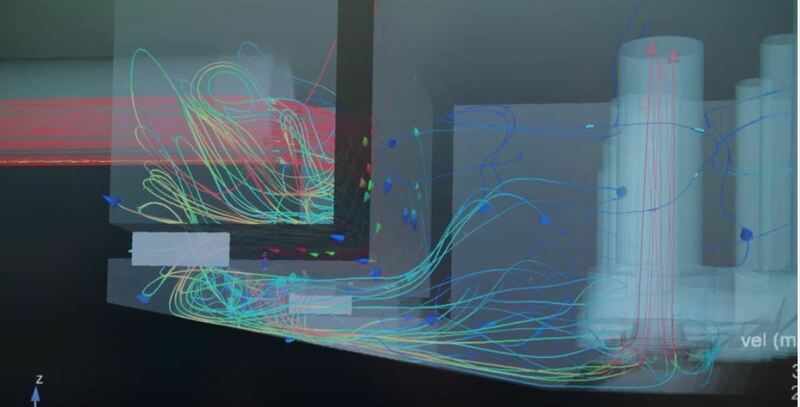 Take advantage of Flygt pre-engineered station designs that are based on the results from computational fluid dynamics (CFD), physical modeling and verification with real-world installations. 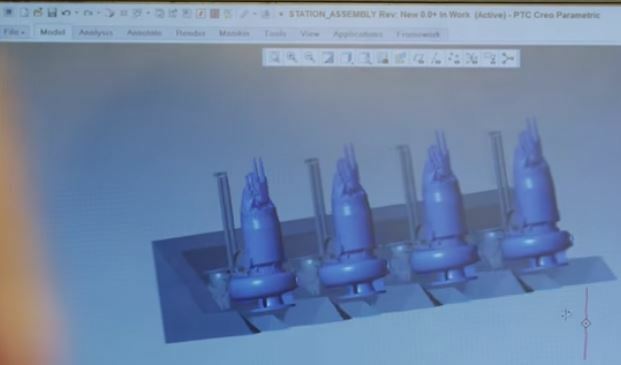 Flygt’s “SECAD” pump station tool provides in minutes, a customized design based on an approved Hydraulic Institute (HI) Standards large station design. A complete 3D design is provided with AutoCAD drawings with self-cleaning design and uniform approach flow to the pumps with no adverse hydraulic phenomena, eliminate issues with sediment or floating debris, eliminate or reduce the costs relate to cleaning and maintenance. Ultimately, these improvements benefit our customers through lower cost and reduced risk related to pump station construction and operation. Whatever your pump station challenges, we can help you easily find the solution that works best for you. Whether it is designing an entirely new pump station, or improving an existing one. Our broad range of products will also help you ensure trouble-free operation. 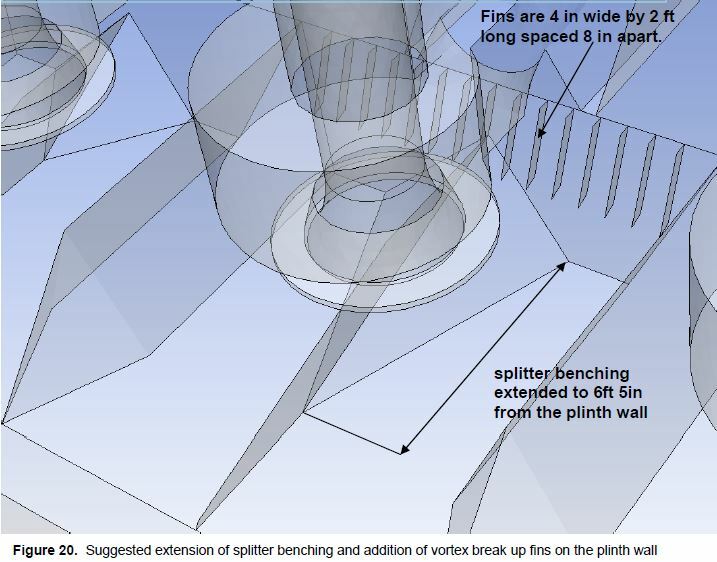 In order to remediate the excess inlet pre-swirl and submerged vortices observed in the analyses performed on the original design, several changes to the sump geometry have been recommended and subsequently tested. These changes are illustrated in Figures 19 and 20 below. 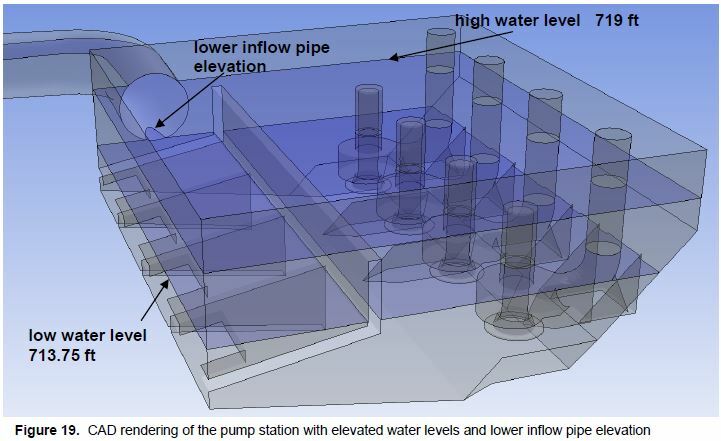 Figure 19 is a CAD rendering of the station showing a repositioned inflow pipe to a lower elevation and an increase in both high and low water levels. Changing inflow pipe elevation and water levels means there will be more energy dissipated in the inflow region before the flow enters the sump. Bulk flow patterns from Case 1d, the low water case with Pump 4 in service, are shown below in Figure 21. The upper illustration shows the case before and the lower illustration shows the case after modification. One can note that the increased depth results in much lower velocities in the inlet channels. There is still some skewness of the flow in these channels, but it is not as severe as was the case with the original geometry. The bulk flow patterns shown in Figure 22 are from the high water Case 2d. Like the low water cases, the skewness of the incoming flow is significantly reduced in the modified sump. The water level in the modified case is sufficiently high so that there is some flow passing over the wall separating the inflow area from the sump. This also helps lower the velocities in the inflow channels. 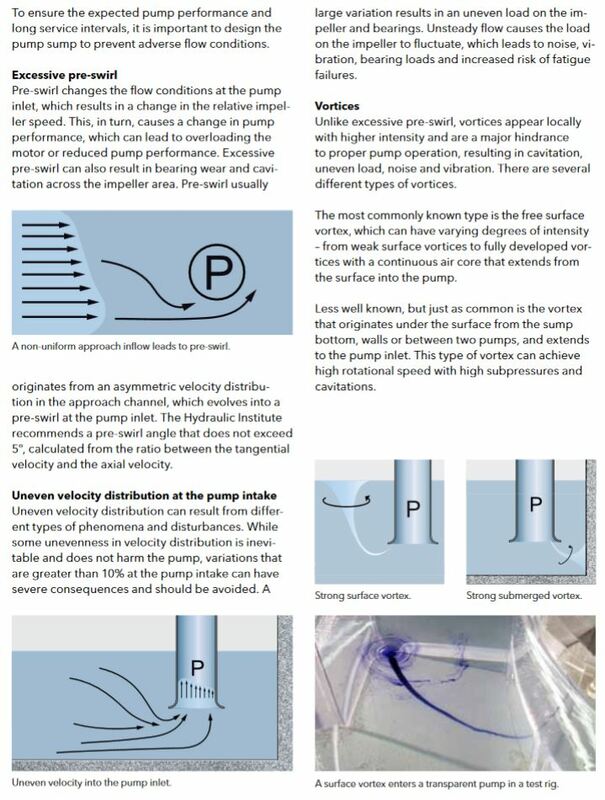 Figure 20 shows some geometry changes proposed to diminish the likelihood of submerged vortices that might enter the pump intakes. In some of the pumps in the high water cases, potential vortices were observed directly beneath the pump intakes. Circulation zones that can develop in this location are common due to there being flows from several directions that come together here. Filling in these regions with a solid is a remedial approach that is effective. To that end, the benching on the splitter beneath the pump is extended to 6 ft 5 in from the plinth wall. 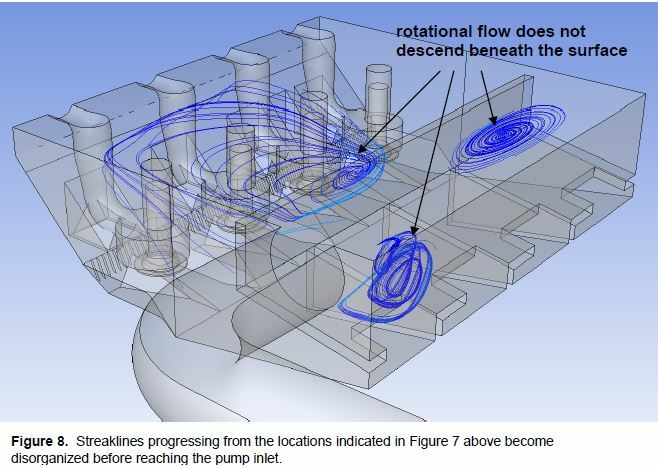 Vortices that form on the plinth wall are typical in centrifugal pump installations of this type because there is often flow moving downward around either side of the pump discharge connection and initiating a re-circulating flow pattern. 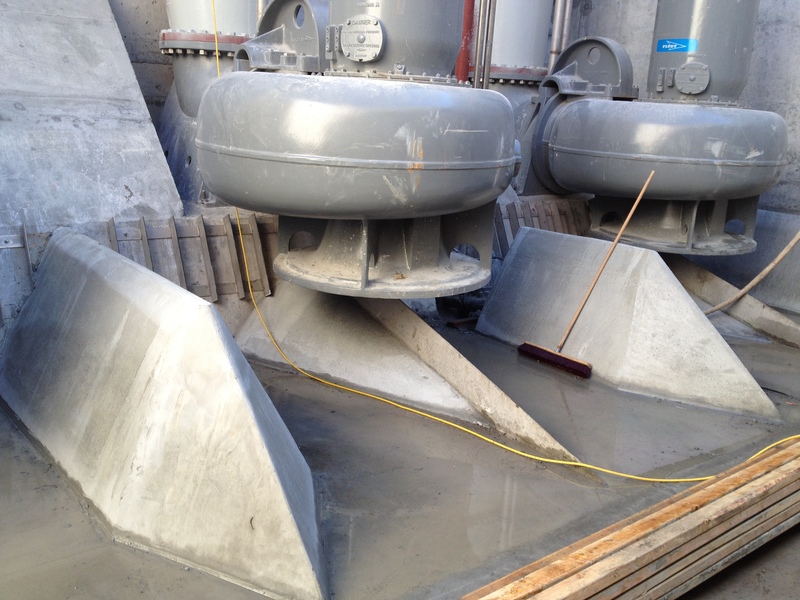 Fins attached to the upper part of the plinth wall will break up any re-circulating flow patterns that form there. Sites for potential surface vortices in the high water case are identified in Figure 7 below. This is a plot of streaklines originating on the water surface. Re-circulation zones are a tell tale sign of potential vortexing. 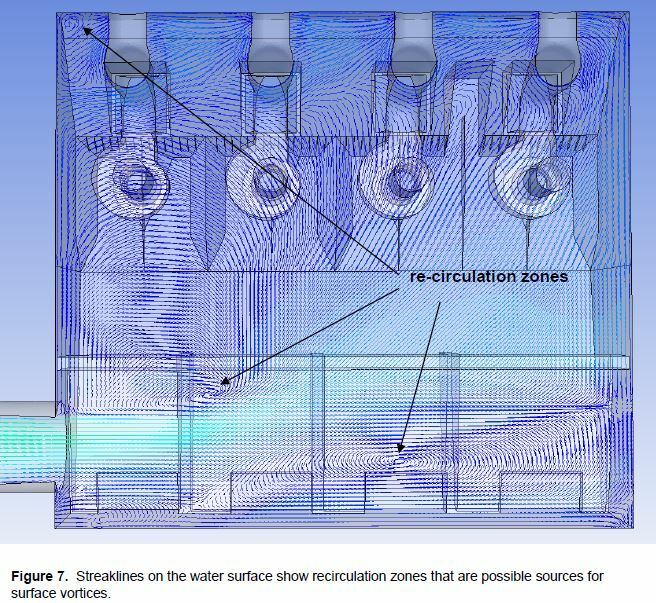 Initiating streaklines at the centers of the re-circulation zones and allowing them to progress towards the pump intakes is analogous to the dye injection that a physical modeler would do to identify and classify vortices. Figure 8 below shows the progression of streaklines from the re-circulation zones identified above in Figure 7. The upper illustration in Figure 7 shows the re-circulation zone does continue to rotate for several feet below the surface, but ultimately becomes disorganized. In the lower illustration, the other three re-circulation zones appear to be confined to the water surface. 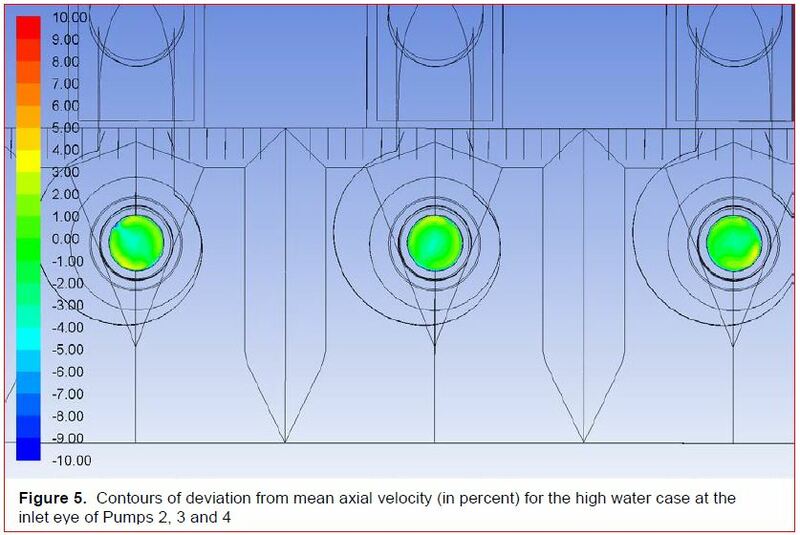 The CFD models run in this study indicate that the Pump Station will operate in a satisfactory manner for pumping conditions within the range of cases tested. These recommended changes comprise elevated water levels for both high and low water operational points, lower elevation for the station inflow pipe, extended benching on the splitter beneath the pump intakes and installing fins on the plinth walls. 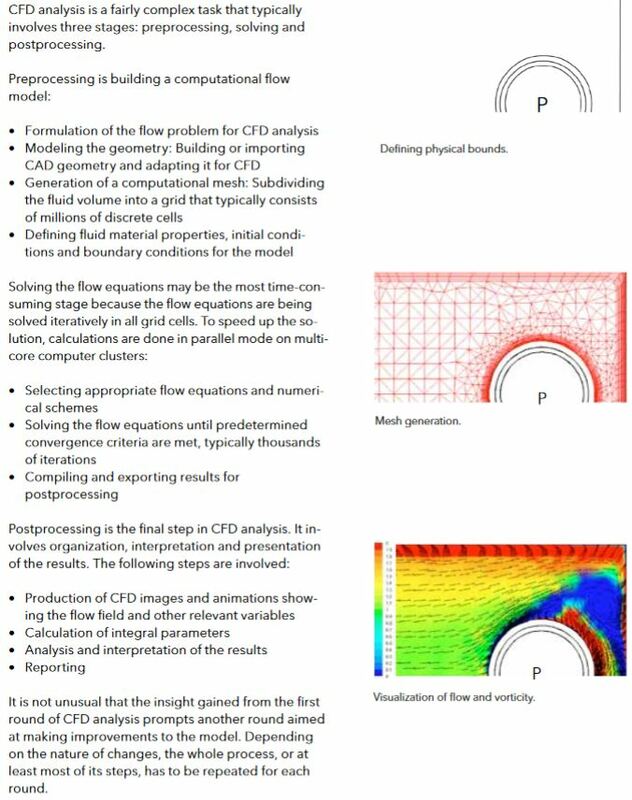 The CFD analysis on this project was important identifying pump approach flow problems. In the low water cases with one pump in service, the flow entering the sump through the four inflow channels is skewed to the side of each channel furthest from the inflow pipe. 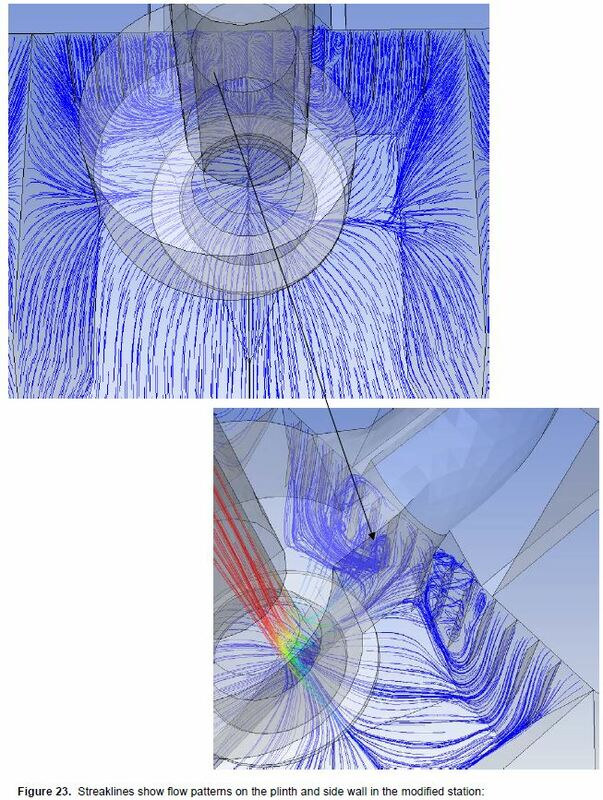 This skewness is the result of the high velocity of the flow entering the station through the inlet pipe and gives rise to the high pump intake pre-swirl angles observed. The inflow part of the station is isolated from the sump where the pumps are by a wall thus forming a lateral inflow channel. All the water entering the sump does so through holes in the floor of this inflow channel and passes through four channels oriented towards the pumps. At this time, the water has a significant lateral component that gives rise to the skewness observed in the pump approach flows. Increasing the volume of water in the inflow channel will allow some of the energy in this region to dissipate before entering the sump. The high water cases with three pumps in service exhibited skewed approach flow patterns similar to those observed in the low water cases, but these were less severe due to the increased volume of water in the inflow channel. An increase in water level for the high water cases should help even further. Vortices observed in both high and low water cases were the submerged type typical for submersible centrifugal pump installations. Modifying the benching beneath the pumps and roughening up the plinth walls behind the pumps are typical fixes for these flow problems. Changes to the pump station design to remediate the adverse flow conditions were tested. These included elevated water levels for both high and low water operational points, lower elevation for the station inflow pipe, extended benching on the splitter beneath the pump intakes and fins on the plinth walls. Lowering the inlet pipe elevation and elevating the water levels brought about a significant improvement regarding the skewness observed in the approach flows. As a result, pump inlet pre-swirl angles diminished to within the acceptable range. The benching and fin additions used to eliminate submerged vortices were effective as well. from selecting the limits of the model, through developing computational meshes, using correct numerical techniques to correctly interpreting the results. The expertise also comes in handy in finding effective solutions to any encountered problems. 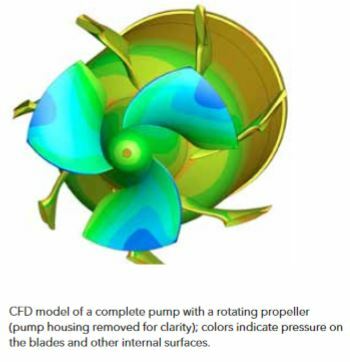 Flygt initially used CFD for developing turbomachinery: pump impellers, volutes, mixers and other hydraulic parts. Currently we can model complete pumps with rotating impellers or more complex systems such as pump stations, mixing or aeration tanks. 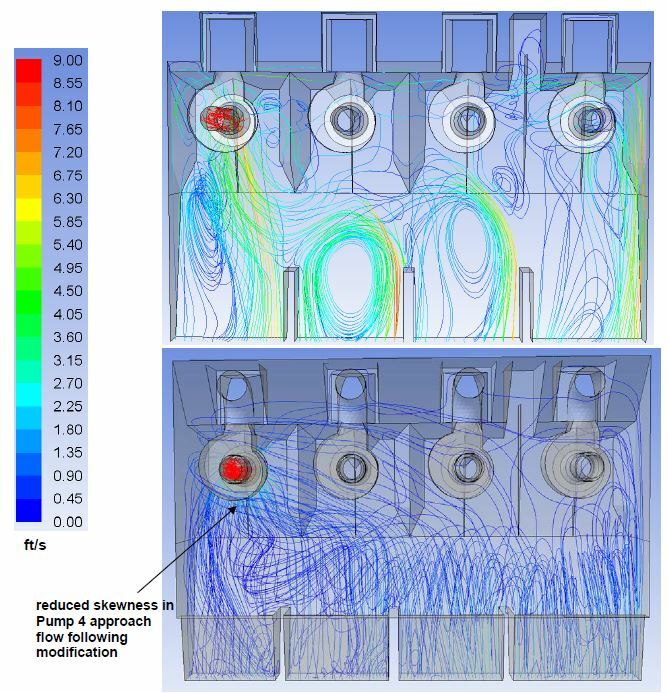 We promote the use of CFD in designing pump stations for customer projects for any non-standard configuration or any large pump station if the risks involved outweigh the costs of CFD modeling. Flygt uses three different top-ranked CFD codes: ANSYS Fluent, ANSYS CFX and CFD++. Flygt uses other state-of-the-art software for meshing and postprocessing.